2. A hard disk containing virtual machine images to be used for hands on training on the day which can be used for further training after the event (valued up to $ 100 ex). 3. Course notes, white papers, documentation etc. This session will show you how to install, manage, maintain and migrate SharePoint. You’ll also learn how to enable additional features with SharePoint to greatly improve its functionality. You also gain deep insight into SQL Database management as well as how to troubleshoot common SharePoint issues. This session will focus on the business applications of SharePoint and how it can improve business processes. You’ll learn about integration with Office products such as Word, OneNote and InfoPath. You learn how to build automated business solutions and template them for use in other SharePoint sites. Single session – $ 299 ex GST (including a 6 month subscription to CIAOPS SharePoint Guide). I expect these sessions to fill quickly given the total limit of 20 attendees. There are currently 2 dates confirmed for Sydney with some tentative dates in Brisbane and Melbourne (depending on numbers and venue arrangements). Please visit www.ciaops.com/bootcamp for more information about these dates. As an early bird bonus if you sign and pay before May you’ll receive immediate access to the CIAOPS SharePoint Guide (www.wssops.com) but your subscription will commence in May 2011. Any questions please let me know (director@ciaops.com). The latest episode features Matt Makowicz from the Ambition Mission speaking about breaking through revenue barriers in business and building a sales team. where you can not only subscribe via mediums such as iTunes but also leave comments and ratings on each episode. If you are interested in, or know a business that is, sponsoring the show please contact me directly (director@ciaops.com). Also if you would like to appear as a guest or would like to hear from someone specifically again contact me (director@ciaops.com). Finally, if you think the show has provided you with value I’d appreciate any donation you’d care to make. All donations go to helping me improve what is offered (http://www.ciaops.com/donation). Just over 4 years ago I started to upload videos to YouTube. About 2 years later I open a new YouTube account and continued to upload videos there. Since that time I have not uploaded any new videos to the original account. Now over 2 years later that original account has reached over 500,000 views and 582 subscribers! Amazing. I still continue to get plenty of feedback, comments and subscribers to something that I haven’t basically changed in over 2 years. The video with the highest views (shown above) has over 63,000 in total. <img onload="var downlevelDiv = document.getElementById('500ab879-b193-4ee7-b051-f1c4e4dfe9ba'); downlevelDiv.innerHTML = "
Each video incorporates subtle changes that help me understand what works best for video production on the web. Sometimes I’m looking to understand audio, others its about resolution but each video is a another test in an effort to find the best methods of production. All of this testing allows me to typically improve what I provide to subscribers of my SharePoint Guide as I have found that people are far more receptive to short video tutorials as an adjunct to the printed material in the Guide. My aim is provide at least one video tutorial to subscribers to allow them to quickly get up to speed on SharePoint. Many question the value of YouTube but I see it as one of the main marketing methods available to me to reach a potential world wide audience. Creating videos these days is so easy that there should be no excuse why you aren’t doing so if you are in business. In most cases it is not creating the video that is problem but what to create videos on. Smart businesses will learn to understand how they can use video to reach more customers and generate business. Others dismiss it as a waste of time. My response to that is fine, but for me the results speak for themselves. One of the really great features of SharePoint 2010 is the fact that it can used as a platform for Office Web Apps. Office Web Apps allows the ability to work with Office documents using only a web browser. You can see this for yourself if you have a Skydrive account. SBS 2011 Standard has SharePoint Foundation 2010 included and many were looking forward to the opportunity of running Office Web Apps on their SBS 2011 Standard installation. In a small business environment, Office Web Apps makes a lot of sense since it provides greater flexibility for the business, especially in conjunction with remote access. The problem is that Microsoft has now said it won’t support Office Web Apps on SBS 2011 Standard. with our commitment to security and reliability for the Windows Server platform. Office Web Apps is fully supported on SharePoint Foundation Server 2010 running on the SBS 2011 Premium Add-on, or a non DC member server, and you can integrate this back into your SBS 2011 environment using these steps http://technet.microsoft.com/en-us/library/gg616007.aspx. However,you will still require VL licensing for Office 2010 to utilize Office Web Apps. Some have raised the point as to how running Office Web Apps on a domain controller is any different from running Exchange, SharePoint and ISA on a domain controller which are also not ‘supposed’ to be run there. Different versions of SBS have done this for years, that is just the way SBS is. The current version of SBS also allows remote access via web folders, so how are any of these really any different to Office Web Apps in the security context mentioned? At the moment, when you install Office Web Apps on SBS 2011 Standard, it will break things. There is no doubt that ‘work arounds’ will become available, however as it currently stands there is no supported method of installing Office Web Apps on SBS 2011 Standard (except on a second server) and that my friends is a damm shame, a damm shame. If you download and install SharePoint Foundation 2010 from the Microsoft web site and use it with the default options you’ll end up storing the content on SQL Server 2008 Express which is limited to 4GB database sizes. if you work with SharePoint Foundation 2010 on SBS 2011 you’ll end up storing the content on SQL Server 2008 Express R2 which allows databases up to 10GB in size. One of the options beyond that is Binary Large Object Storage or BLOB storage. So what’s BLOB storage? Many SharePoint sites are full of things like pictures, documents and the like which can vary in size from a few kilobytes up to many megabytes. The larger these ‘binary objects’ become the more size they chew up in the SQL database in which they are stored. SQL databases are typically not the best places for storing large binary data. In order to reduce the size of the SQL databases and improve their performance you can enable BLOB storage which basically allows this large data to be stored on the file system rather than in the database, yet still take advantage of many of the features that databases provide. – BLOB storage adds complexity to SharePoint. How do you backup and restore BLOBs? How do you configure and enable it? What happens when you need to migrate data? – If you work with a lot of files and BLOB storage you are going to end up with lots of orphaned BLOB stores which will require tidy up. – You cannot assume that your current implementation using the present version of the software will be compatible with future versions of Microsoft Office or SharePoint Foundation (this straight from the Microsoft technical document). – No utility is available for moving BLOB data from an existing content database into the external BLOB store. After you enable BLOB storage on SQL server on new BLOB data will end up in the BLOB storage location. – Some backup and restore functions in SharePoint Foundation operate on the content databases but not on the external BLOB store. You must handle the backup and restore of external BLOB data differently to standard SharePoint. – Microsoft recommends that if the content databases become larger than 16GB you upgrade to the full version of SQL Server that provides for unlimited database sizes. – Remote BLOB storage is most useful for large file storage, typically in environments that require archiving. – Once you enable remote BLOB storage all BLOB data ends up there. This means that if you have lots of small BLOB files accesses regularly you may experience latency. – SQL BLOB Storage using FILESTREAM with SharePoint Foundation can only be to the local drives and does not support snapshot backups. On balance then I think that if you are approaching the 10GB limit with the free version of SQL Server 2008 Express R2 it’s time to think about upgrading to a full version of SQL rather than implementing BLOB storage. Too me, from what I see, there is just too much downside. The latest episode features Todd Colbeck from the Colbeck Coaching Group speaking about referral systems. We cover 12 systems that you can quickly and easily implement in your business to generate more leads. After the Christmas / New Year break many traditional retailers started to mount a campaign to lobby the Australian Government and people that a greater duty should be imposed on goods purchased overseas on the Internet. Their reasoning? These overseas purchases where not being charged the Goods and Services Tax (GST = 10% on top of price). They claimed this to be grossly unfair and made them uncompetitive. Initially Gerry Harvey, owner of Harvey Norman department stores took the lead role but was resoundingly shouted down by social media. You can read about that here. Well Gerry, let me share with you my own experience and why you are living in the past. I was after some SharePoint 2010 books. I keep my reading list at www.goodreads.com (you can connect with me there if you want and view my lists and reviews. Just use director@ciaops.com to connect) so I did a look up of the book I was interested in on Amazon. I like Amazon for many reasons but one is the reviews. I checked out the reviews and ratings, then judged the book to be a good investment. However, instead of buying it through Amazon I usually try and support an Australian business. So I looked up the same book there. this time almost THREE times as much! Again – SAY WHAT?? Look, I appreciate that there are different publishing laws, sellers, shipping etc involved here, however at a current exchange rate of about one Australian Dollar to one US dollar, guess what? As the customer I DON’T CARE. I’m prepared to wear a small mark up to support an Australian business, but really TWO and THREE times as much? I’m afraid not. Amazon will probably deliver just as fast, provide better customer service, reward my loyalty and even give me the option to download it electronically on to just about every device I own. You local resellers just don’t get it do you? How can you afford to be so much out of whack with international offerings that are geared to World market? You are putting yourselves out of business at these rates and I honestly say good riddance. If you are going to be THAT uncompetitive you don’t deserve to be in business because somewhere along the line SOMEONE is ripping me off and as a customer I DON’T CARE! You think that I’m not smart enough to use my computer and make a few comparison eh? Well I ain’t too stupid to waste my money on what is essentially an identical article at a 200% and 300% mark-up. because locally it is still 2.5 times more expensive! When you do your Internet banking you (hopefully) do so over a secure encrypted connection. Amoungst other things, this ensures that no one else can see what you are doing. Unfortunately, other sites don’t usually do any encryption. Enter Firesheep. This is a free utility anyone can download, install on their wifi enabled machine and basically take over your Facebook connection if you use it an open wifi hotspot like a coffee shop. Have a look at this article for more information on what is possible. One way to thwart such attacks is to use a https (i.e. http with security) when using a service. Problem is most common social networking services don’t support a connection at their end. However, now Facebook does. 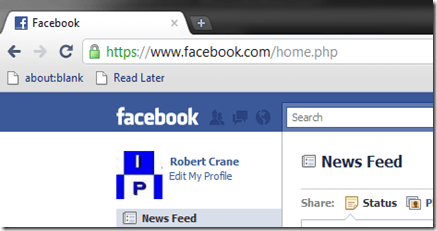 Save the setting and then reconnect to Facebook. You should now see that you are connecting via https (i.e. securely). 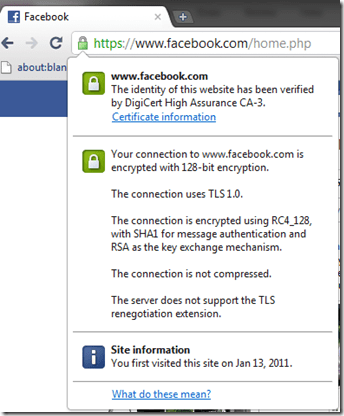 This means all information sent from your browser to Facebook and back is encrypted and secure. Hopefully it won’t be long before all the other majority sites also go secure. In reality there is no real technical reason why every site can’t be https. However, there are people out there who still really want to see where you browse and they have a fair amount of clout. Don’t forget that you still need to ENABLE this, so do it NOW and you’ll be much safer when you access facebook. Hopefully the first steps to a fully https world!